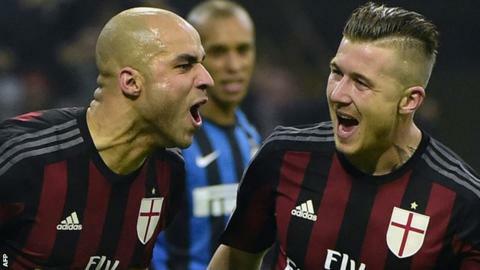 AC Milan secured an impressive Serie A derby victory as Inter missed a penalty and saw boss Roberto Mancini sent off. Centre-back Alex headed Milan into a first-half lead, before Mancini was dismissed from the dugout for arguing over a rejected penalty appeal. Mauro Icardi then hit the post from the spot after he was brought down by Alex. Milan struck twice in the final 20 minutes, with Carlos Bacca turning in a cross from M'Baye Niang, who added a third from Giacomo Bonaventura's pass. The result leaves the rivals as they were in the table, Inter fourth and Milan sixth. Both sides looked very ordinary for long spells at the San Siro, with neither suggesting they have the quality to match title contenders Napoli and Juventus. Crucially, though, Milan kept their composure when it mattered, and secured a win that dealt a significant blow to Inter's Champions League hopes. Mancini lost his head early in the second half when debutant Eder's penalty appeal was rightly turned down, with Milan's teenage goalkeeper Gianluigi Donnarumma getting the ball as he collided with the striker following his own sliced clearance. Inter failed to take advantage when they had the chance to draw level from the penalty spot, and lost their defensive discipline as Sinisa Mihajlovic's side then struck twice in quick succession. In the minutes before kick-off, Milan's fans unfurled a banner depicting the thunderous header from former England striker Mark Hateley that ended a long wait for a derby victory over Inter in October 1984. Mihajlovic's side took the lead in the 2016 version with a similarly powerful header, as Alex got in behind Davide Santon to convert Keisuke Honda's cross - the first headed goal Inter have conceded in Serie A this season. It was a poor night for former Newcastle right-back Santon, recalled for his first start since late October, capped when he gave the ball away to Bonaventura, who set up Niang for Milan's third. Mancini pinned his hopes of goals on Eder, the Italy international striker signed on a two-year loan from Sampdoria during the week. Inter's boss decided against partnering Eder with his former Samp team-mate Icardi, dropped to the bench after missing an easy chance during last weekend's 1-1 draw against relegation candidates Carpi. The new signing made a lively start, but fluffed his big chance when he miscued a header from Juan Jesus's left-wing cross when unmarked seven yards from goal. It brought to mind Mancini's put-down after Icardi's bad miss last weekend, when he said: "I would have scored that and I'm 50 years old." As if that was not bad enough, Icardi made a mess of his big chance yet again when he missed from the penalty spot. Both clubs are in midweek Serie A action on Wednesday - Inter are at home to Chievo, while Milan travel to Palermo. Match ends, Milan 3, Inter Milan 0. Second Half ends, Milan 3, Inter Milan 0. Substitution, Milan. Kevin-Prince Boateng replaces Keisuke Honda. Substitution, Inter Milan. Alex Telles replaces Adem Ljajic. Corner, Inter Milan. Conceded by Alex. Substitution, Milan. Andrea Bertolacci replaces Carlos Bacca. Attempt missed. Juraj Kucka (Milan) right footed shot from outside the box is close, but misses to the right. Corner, Milan. Conceded by Miranda. Attempt blocked. Keisuke Honda (Milan) left footed shot from the right side of the box is blocked. Assisted by Mario Balotelli. Attempt saved. Mario Balotelli (Milan) right footed shot from the centre of the box is saved in the bottom right corner. Assisted by Keisuke Honda with a cross. Substitution, Milan. Mario Balotelli replaces M'Baye Niang. Substitution, Inter Milan. Felipe Melo replaces Ivan Perisic. Goal! Milan 3, Inter Milan 0. M'Baye Niang (Milan) right footed shot from the centre of the box to the high centre of the goal. Attempt saved. M'Baye Niang (Milan) right footed shot from the centre of the box is saved in the centre of the goal. Assisted by Giacomo Bonaventura. Attempt missed. Éder (Inter Milan) header from the centre of the box is close, but misses to the left. Assisted by Adem Ljajic with a cross following a corner. Goal! Milan 2, Inter Milan 0. Carlos Bacca (Milan) left footed shot from very close range to the top right corner. Assisted by M'Baye Niang with a cross. Attempt blocked. Carlos Bacca (Milan) right footed shot from the left side of the box is blocked. Assisted by Giacomo Bonaventura. Penalty missed! Still Milan 1, Inter Milan 0. Mauro Icardi (Inter Milan) hits the right post with a right footed shot. Penalty Inter Milan. Mauro Icardi draws a foul in the penalty area. Penalty conceded by Alex (Milan) after a foul in the penalty area. Attempt saved. Mauro Icardi (Inter Milan) right footed shot from the right side of the box is saved in the bottom left corner. Assisted by Adem Ljajic. Juraj Kucka (Milan) is shown the yellow card for hand ball. Substitution, Inter Milan. Mauro Icardi replaces Stevan Jovetic. Offside, Milan. Keisuke Honda tries a through ball, but Carlos Bacca is caught offside.